The Shoto Museum of Art opened in October 1981. 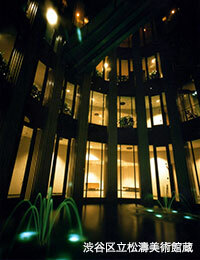 The building was completed under the design of Seiichi Shirai, known as a “philosophical architect.” Together with the Shizuoka City Serizawa Keisuke Art Museum, which also features a pool with a fountain, it is considered a magnum opus of Shirai’s last years and has made great contributions to the advancement of the field. “The art museum that Shibuya will build must be small in scale, yet rich in cultural flavor. It should be a place where all residents, young or old, can comfortably enjoy themselves and relax amid a subdued atmosphere. Shoto, Shibuya, the home of the Shoto Museum of Art, is known as a quiet, upscale residential district. In the original plans, the height of the building was limited to up to 10 meters above ground on a building area of about 500 square meters. 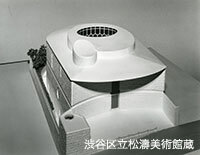 In order to accommodate not only the exhibition space but also requests from the local government, such as the installation of a hall for art classes and a library room for study and research under these conditions, Shirai kept the aboveground portion to just two stories and resolved the space issue by adding two stories below ground. Taking into account the museum’s location in a residential area, windows on the outer perimeter were also kept to a minimum. Instead, a structure was implemented in which light comes in through the central atrium.